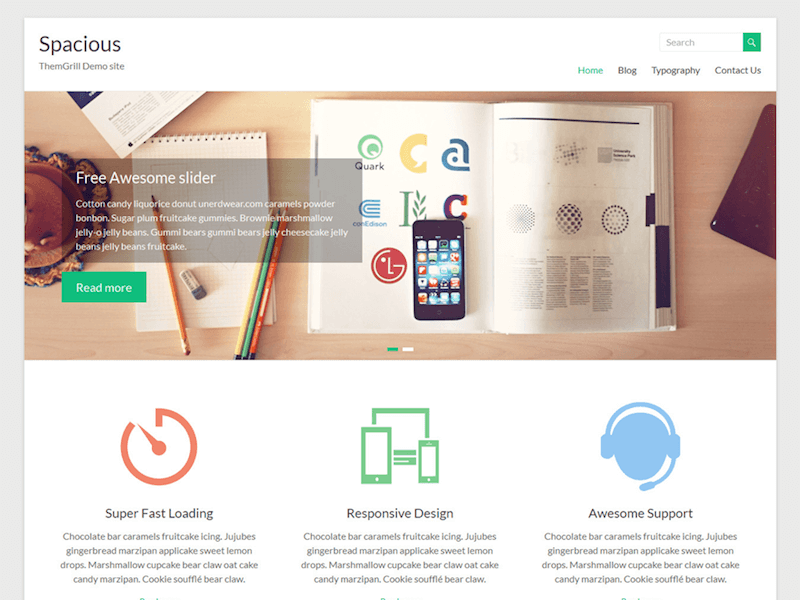 Antreas is a clean and simple free WordPress business website theme. It’s the perfect tool for taking your business projects and ventures online in a flash. You’ll need no prior coding experience to do right by your business with Antreas. Polished, high quality websites are a breeze to create through Antreas. The awesome WP Customizer lets you craft whole sections and layouts like a pro. Handy shortcodes allow you to drop functional elements anywhere on your pages. Introduce your professional team and present your qualifications in style. Attract new business with handsome and flexible pricing tables. Present your products and services in the best light and make the right impression. Businesses large and small can find a home in Antreas. Broad plugin compatibility lets you expand Antreas beyond your wildest dreams. 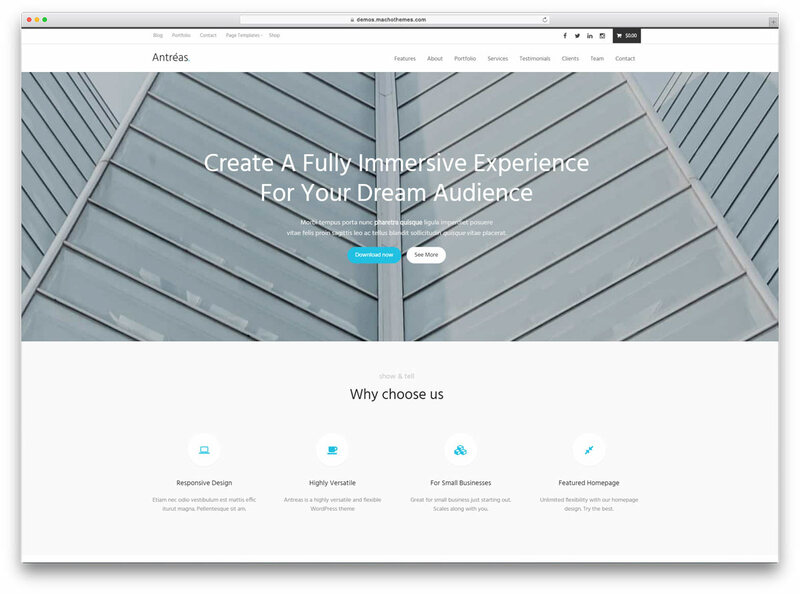 Get Antreas today, and let your project make it big! Looking back at the state of WordPress blogging some 10+ years ago, the lack of female bloggers was fairly evident. In fact, most bloggers were tech savvy people who were experimenting with using a blog as a means of building a community. The community aspects of blog writing have remained the same, but these days we see far more female bloggers than ever before. Especially in categories like Travel, Lifestyle, Fashion, and Food. And it’s a nice change in pace. As a result, we also see far more feminine-style themes, whether it’s on the free marketplace, or on paid marketplaces. 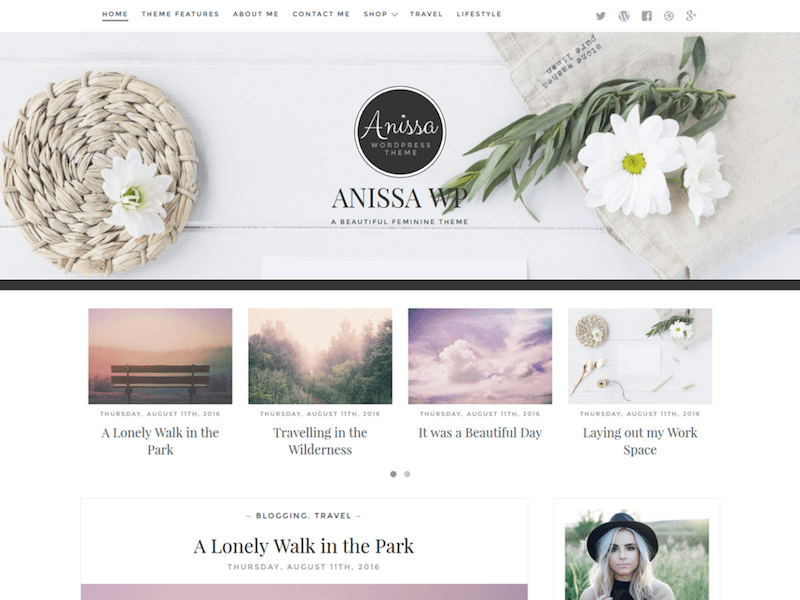 Anissa is a beautiful blogging theme for feminine blogs/bloggers. Everything from typography, colors, and image animations is targetted towards a feminine audience. However, in the features department, the Anissa theme is still a powerhouse and doesn’t limit itself solely on its style choices. Anissa welcomes users with a fluid and responsive design, and tools for personalizing this theme to match your style. Would you prefer a theme which gives your content space? Themes can get overly cramped up with unnecessary elements, and in turn obstruct reader’s ability to engage your content. 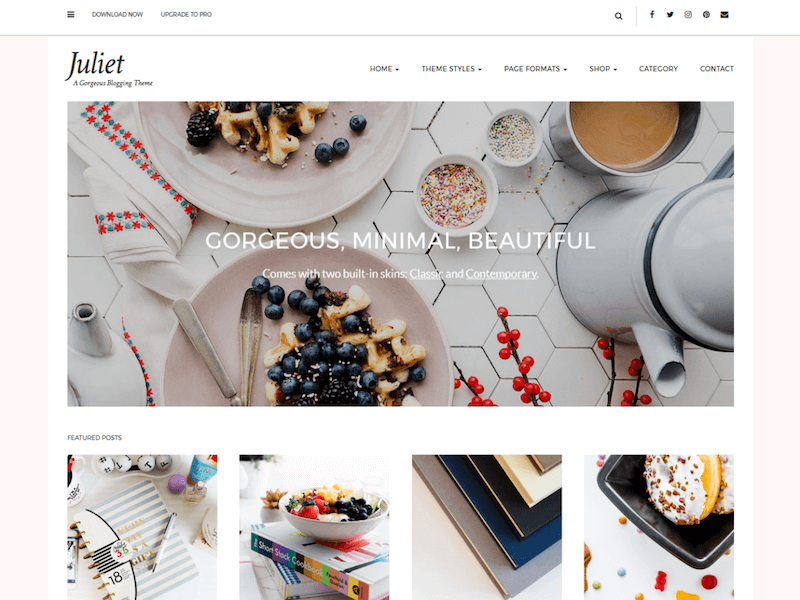 ThemeGrill has published Spacious — a multipurpose theme which welcomes business owners, and bloggers with a business plan in mind. 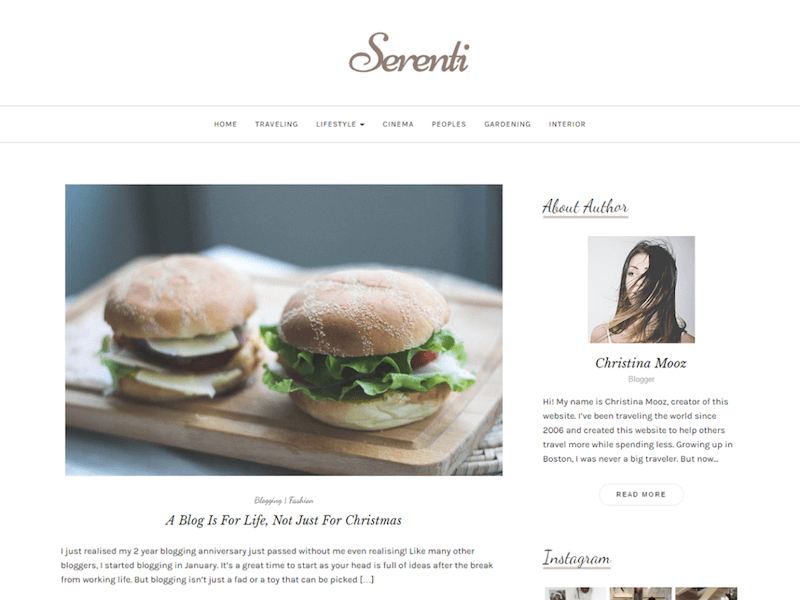 Spacious theme is as flexible towards business needs as it is towards bloggers. With custom styling, custom widgets, and more than ten widget areas, you can go crazy with modifying Spacious to look how you want. The Blog pages have four display types, while pages can be shown in up to four unique layouts. 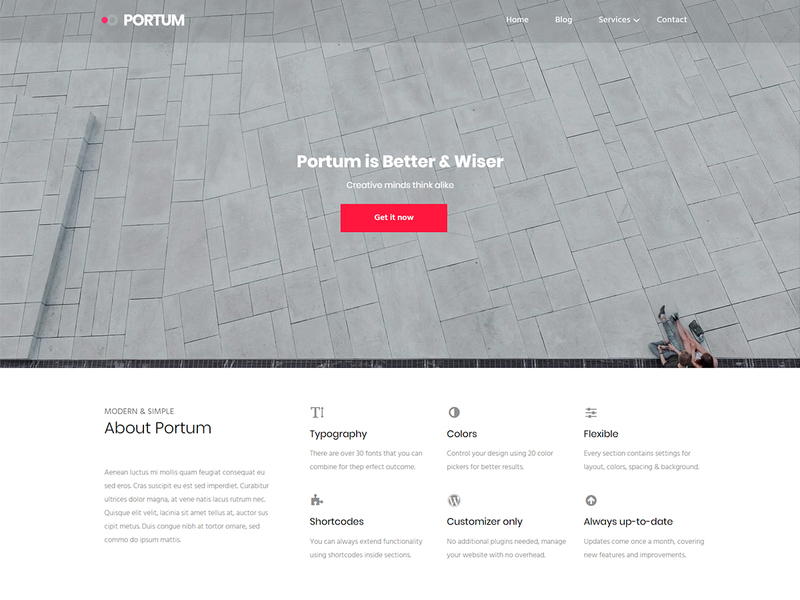 Most of all, Spacious uses a clean output of typography and content placement, making the theme highly readable. And 100,000+ users is more than enough to justify this theme’s popularity. 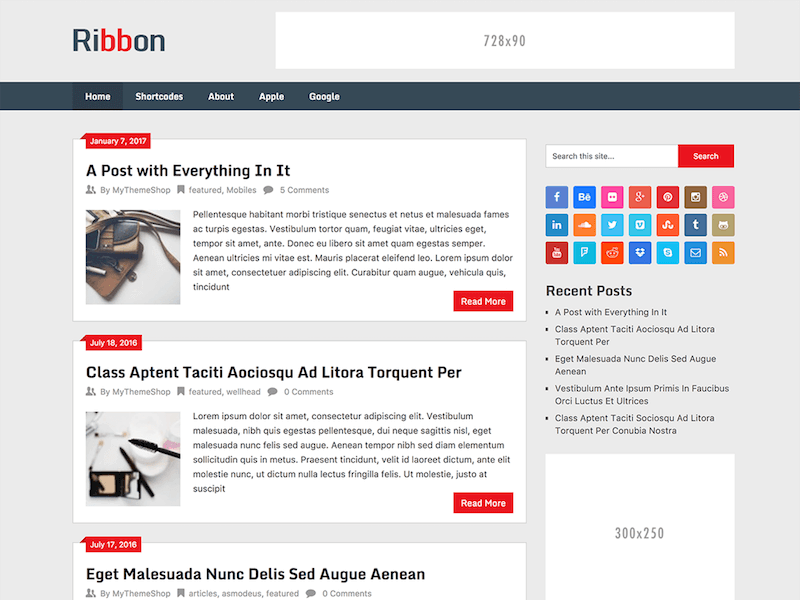 Ribbon Lite is a theme which tries to go back to the classical style of WordPress theme designing. Back in the day, most WordPress themes used nearly identical design patterns. Whereas today, with up to 50,000 themes out there, every design tries to be different. But, if you’re amongst those who like a classical style and embrace the fact that classic WP style is user-friendly, then Ribbon is worth a consideration. 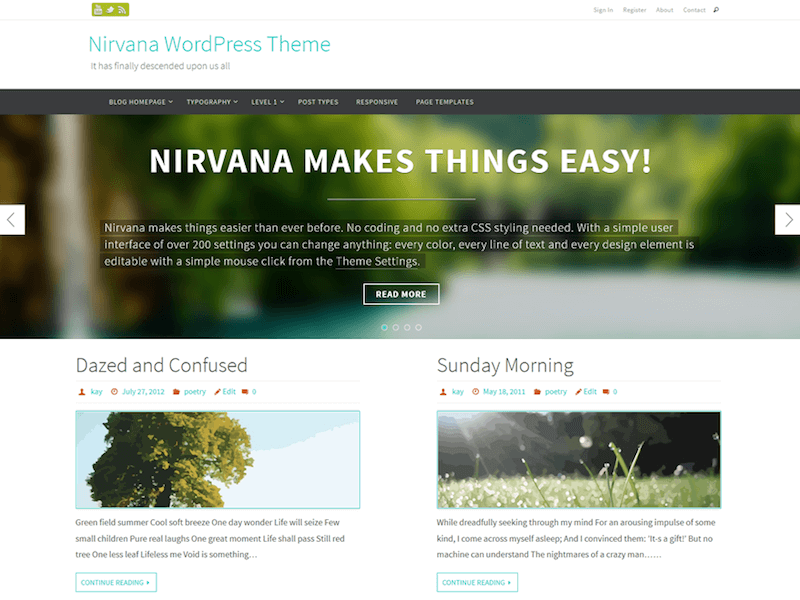 This free theme from MyThemeShop is as simple as it is fast! Pingdom reports a performance grade of 97/100, and the average load time is in the 500ms range. Even premium themes struggle to keep their numbers that impressive. Furthermore, Ribbon Lite’s lightweight codebase is SEO friendly, so you can experience rapid growth of your content’s search rankings. 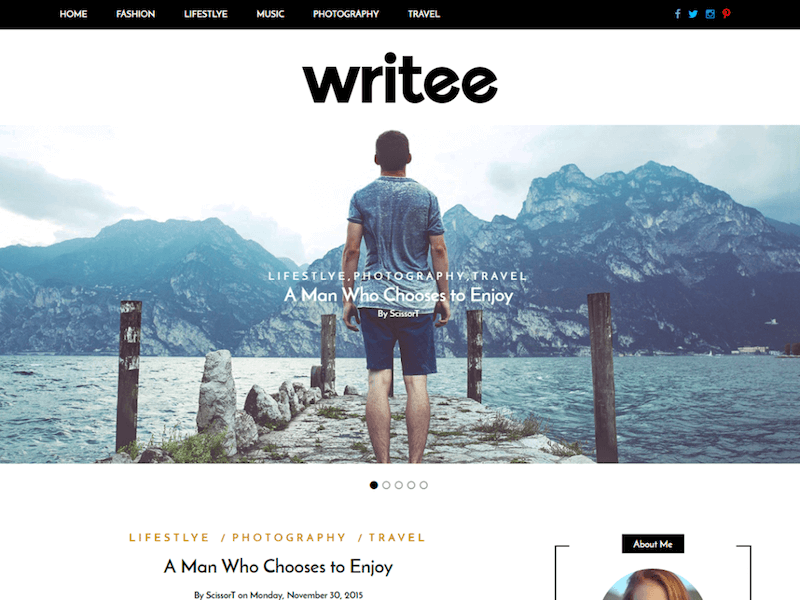 Writee is a blogging theme for writers with 100% positive 5-star reviews. An example of how design effort can lead towards community support. 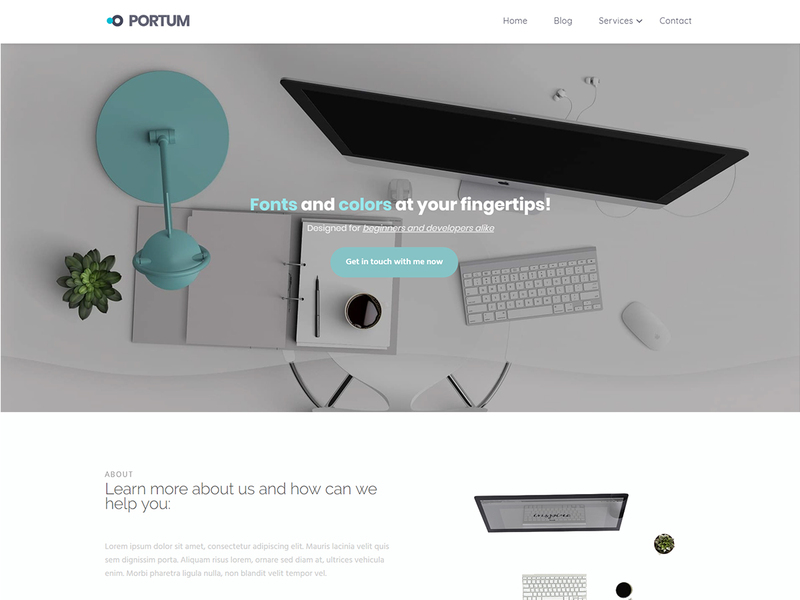 This visually stunning and responsive design theme has a completely unique personality. As such, Writee suits writers with a passion for creative writing and personal blogging. Creative writers often publish more than just written text, and oftentimes expand their content to areas like video and photo. The Writee theme welcomes creative writers from all walks of life, and as such provides custom post formats for publishing more than just blog posts. Widgets, post information, and post outlines use creative border styling, which results in a creative and authentic feel to your blog. GoDaddy is possibly the oldest hosting company that’s still ever popular today. And in the last couple of years, the GoDaddy team have expanded they reach into markets like WordPress. 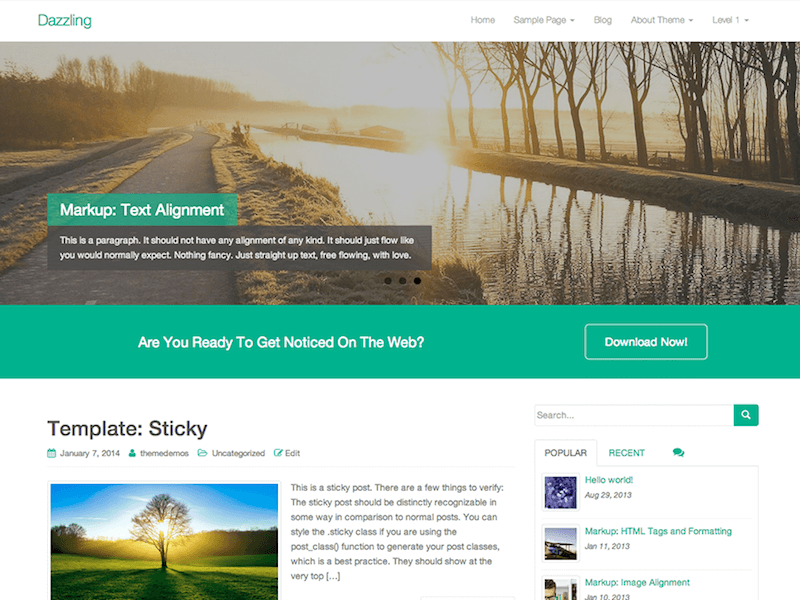 As a hosting company, GoDaddy provides solutions for WordPress bloggers, so it’s hardly a surprise that they would publish their own WordPress themes. Primer is one of their two publicly published open-source templates, and both excel with high-quality styling and great functionality. The basic premise of Primer is responsive design, with as many design customization options as possible. For example, you can jump into the theme options of Primer and change colors, fonts, and choose the layouts in which to present your blog content. Furthermore, Primer is available in 30+ languages upon download. Anyone who has worked with WordPress for 5+ years should be aware of ThemeZee — a brand behind many of the infamous “Zee” themes. 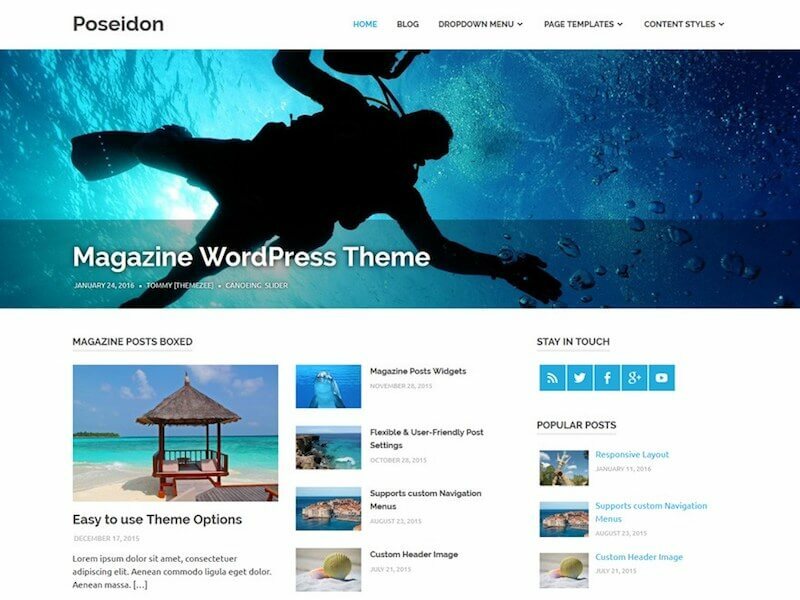 The Poseidon is a frequently updated Blogging and Magazine theme from the ThemeZee brand. And it’s a stunner for sure! Through listening to community input and online reviews, ThemeZee has taken Poseidon to the next level of design. As a result, Poseidon is home to some 40,000+ bloggers. What did we like the most about this gigantic magazine/blogging template? For one, the posts slideshow is absolutely beautiful and easily compares to sliders that you see in premium blogging themes. Another thing is the Magazine Homepage — a completely unique design system where you can add homepage widgets that display your content. So, for example, you can add Magzine Posts Boxed and then a Magazine Posts Grid, and it will show up on your homepage. Talk about a creative use of WordPress capabilities. Of course, those capabilities extend towards Live Customizer. Once you open up Customizer you can adjust general settings, site logo, post settings, slider options, and change the overall color and font schemes. Truth to be told, we could revamp this whole roundup to include only ThemeZee themes alone, but where would be the fun in that? 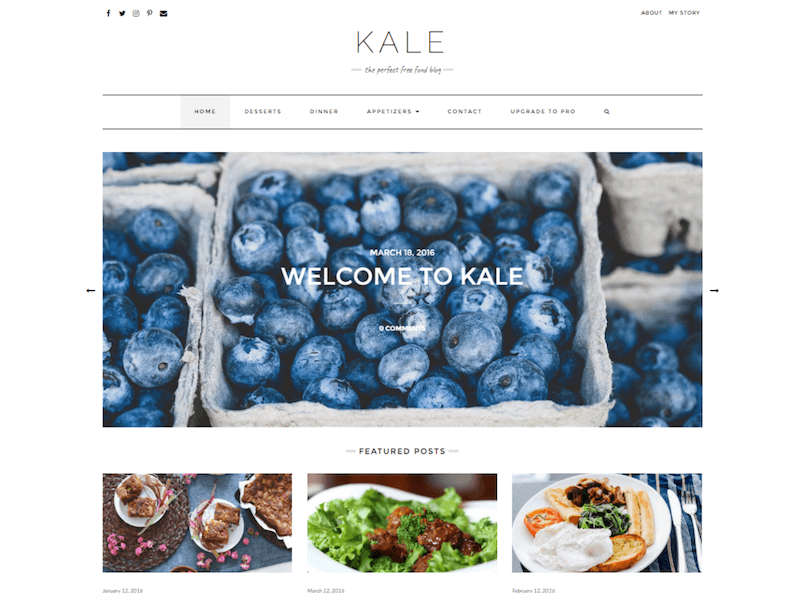 We respect these guys as designers and love their style of theme design, but more than two should be sufficient enough to give you an idea of ThemeZee style. 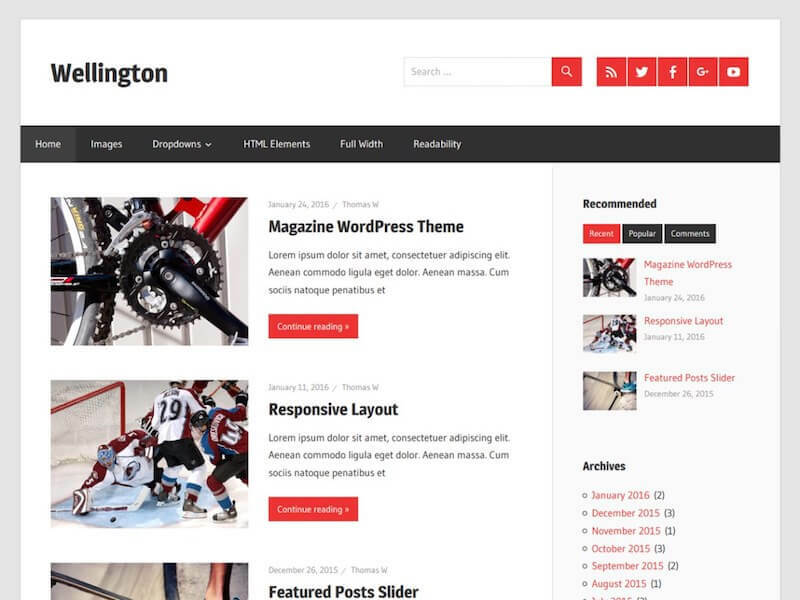 Here is Wellington, another lovely blogging theme which utilizes a boxed design concept. Actually, boxed designed was one of the first design patterns that WordPress themes ever used. And to this day, a large number of bloggers have stuck with their old-school designs because they’re so well-known by readers. Wellington’s responsive markup ensures the best display on smaller screens. Users from countries which don’t use English can easily translate Wellington into a local language. And… the speed is surprisingly swift! Surely with a few thousand blog posts, it might change, but that’s why you have caching plugins, which Wellington is easy to combine with. 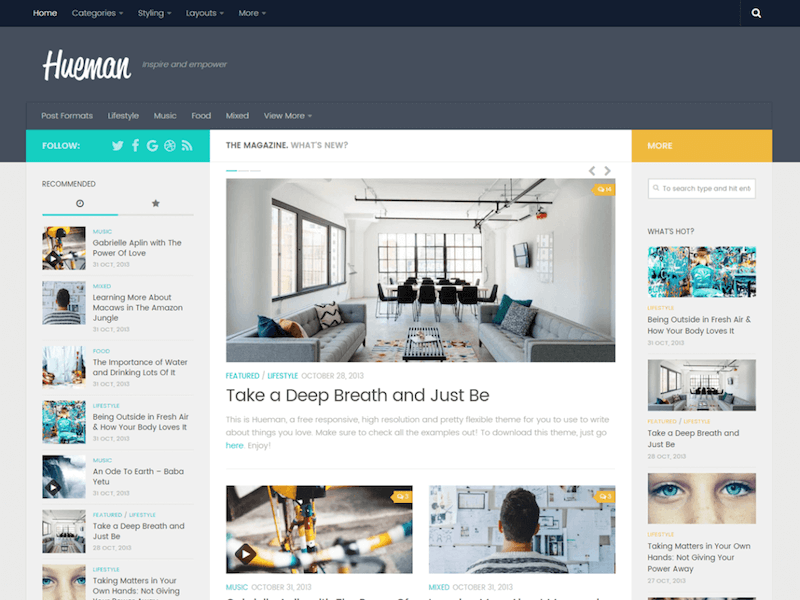 Hueman by Press Customizr introduced a new concept for blog design, and ultimately led the Hueman theme to attracting well over 100,000 users. And if you know anything about marketing a product in a saturated market, then you know a number as high is no small feat. 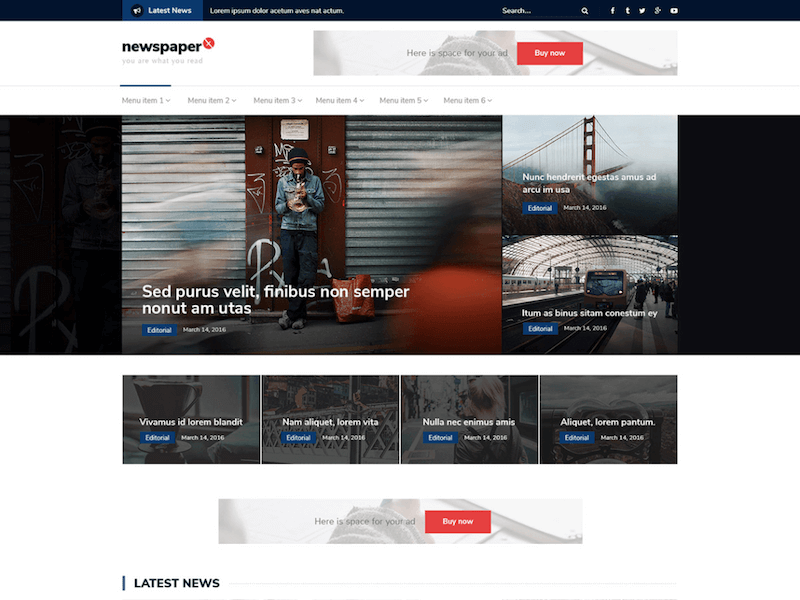 But, Press Customizr deserves the success, as proven by their dedication to consistently improve Hueman to be the best blogging and newspaper theme that it can be. The high-resolution design welcomes retina-friendly devices, while responsive functionality welcomes mobile readers with a high-definition display. 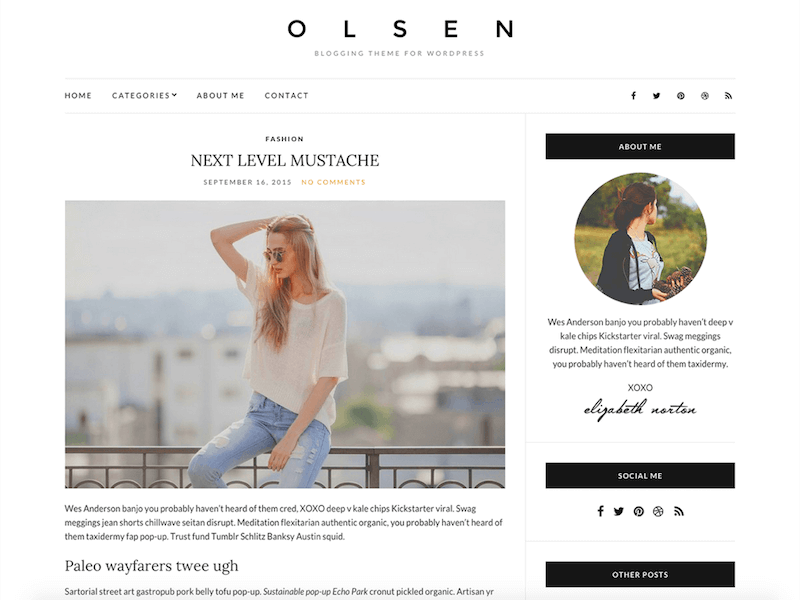 One thing’s for certain, Hueman redefined the way bloggers look at two-sidebar templates. Perhaps in the past, you thought two sidebars is a big “no-no”, but Hueman will make you rethink your decision as it did for me. And although it may feel like Hueman theme is hiding behind a ton of customization, it doesn’t fail to impress when you look at performance grades. Same goes for SEO, with clear markup and instructions for search engines to understand your content in the best way possible. As you get comfortable with Hueman as a standalone design, you can begin tapping into the Theme Design settings. Inside Theme Design you are going to be working with a sophisticated (but simple to use) dashboard of settings for page and post designs. Hard to describe the initial feelings about Blog Way, but they’re all positive! Think of it was a blank page, upon which you’ve written your blog posts, the links you want to use for navigation, and some sidebar information about yourself. Now, imagine that everything you wrote has a smooth border added around it. And, that’s the Blog Way theme! Hopefully, it makes sense, but you can surely see what I mean in the screenshot above. This minimal theme is for writers who love to write and not turn the design into a bigger deal than it needs to be. Great theme for personal lifestyle writers, travel bloggers, and anyone who likes pressing the publish button regularly. 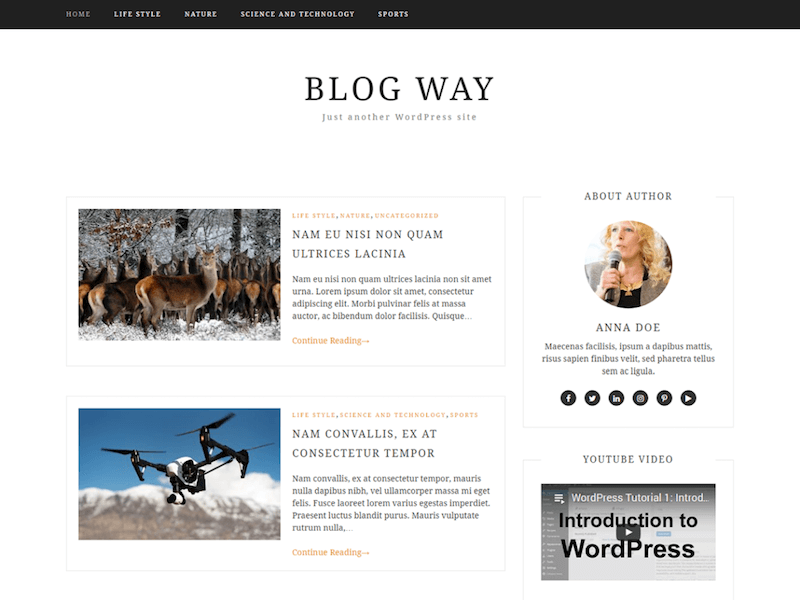 Blog Way Plus (premium version) adds a few other widgets to the theme, but nothing that you couldn’t replace with existing WordPress plugins. Writers tend to go for the simple blogging themes because they don’t hijack what is being published. A magazine theme often looks dazzling as a design product but comes at the cost of being intrusive towards readability. Whereas simple blog themes for writers are focused on primitive needs like clean typography. 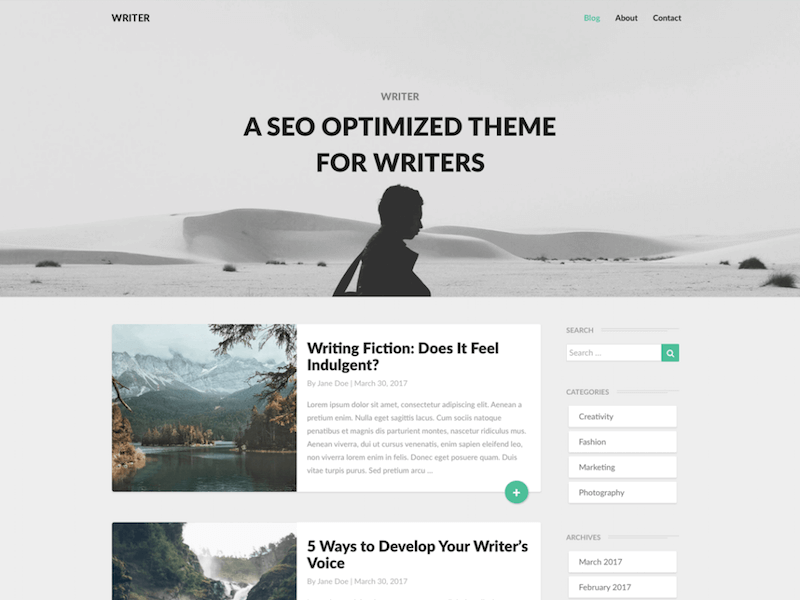 In addition to SEO optimization and lightweight codebase, the Writers theme is flexible enough to provide shelter for bloggers of trendy niches. As a WP theme, Writers will shape your writing into a well presented online portfolio. And what more could you ask for? Vertex introduces a totally original blog concept, and we welcome it with open arms! So, first things first. It’s a blogger theme for bloggers with special needs. Most importantly, Vertex suits photography bloggers and artists who write stories about their art. Let’s recap how Vertex is structured. Upon entering the homepage, Vertex takes up the first section of the site with a full-on slider. In addition to the slider, Vertex uses an overlay compact-menu. In the menu, you have Logo, Social Icons, Menu Links, and Copyright Information. It’s so simple, it’s brilliant. The following sections of Vertex are for blog posts. Clearly presented blog content with high-definition images, and blog post titles as links. 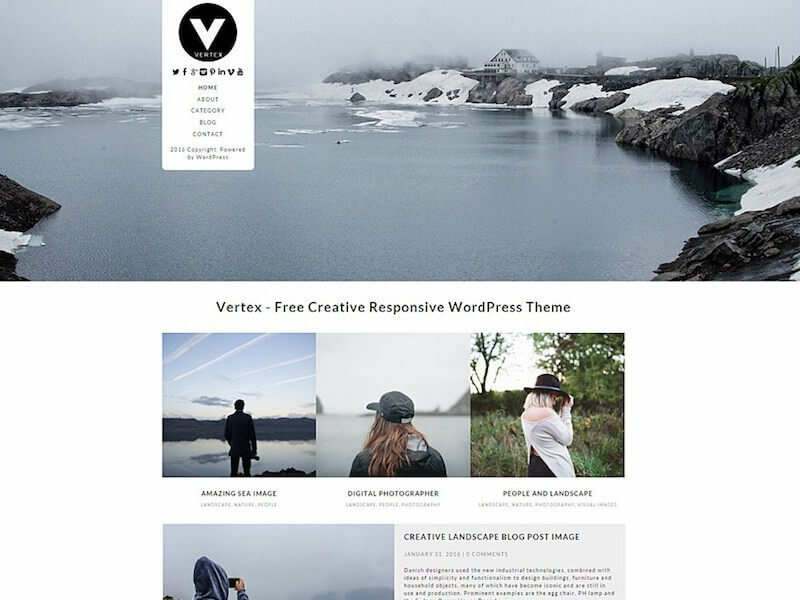 Upon entering a blog post, Vertex transforms into a two-section design. A sidebar (left side) and blog content. As far as we know, the comment section is nowhere to be found. Although it hasn’t been mentioned anywhere in the theme documentation, we don’t believe that you can’t add the comments section yourself. After all, it’s only a single WordPress function to call the comments. However, perhaps this choice of not displaying comments indicates that Vertex suits visual bloggers who simply want a way to house their art for external display. The unique twists of Nikkon theme are endless. How do we mean? Nikkon’s multipurpose extends towards photography blogging and general blogging purposes. A basic design guarantees familiarity amongst readers. But, Nikkon impresses with special attention towards well-known elements. For example, homepage consists mainly of featured images from posts. And colors appear to be gray only. But, once you roll over a particular image, the colors change into the actual colors of the photo. Little adjustments like this make Nikkon a wonderful, unique and creative theme. Furthermore, those of you who like how Nikkon looks can play around with the inbuilt Page Builder. Who knows what you’re going to come up with. 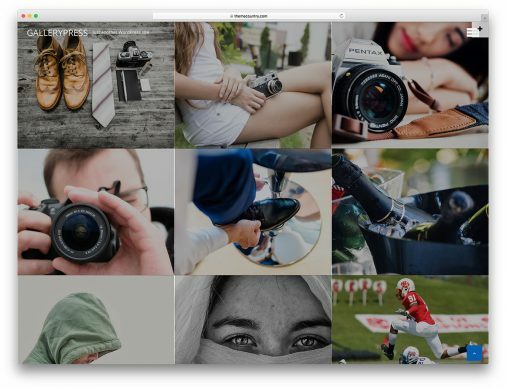 Most of all, as a photographer you are able to sell your photos easily through the WooCommerce plugin support. Getting a design just right takes years of experience. And Design Lab are no slackers. As a reputable brand, Design Lab designers put their heart’s into refining a theme for maximum brilliance. And love is what keeps this world spinning. xMag’s design is a traditional magazine layout, with standard post lists. It looks like xMag’s popularity comes from the overall presentation. Since everything from social links to custom widgets is already included, new users don’t have to twist their fingers to make xMag ready for production. Worth mentioning is that xMag relies on Underscores as its back-end framework. 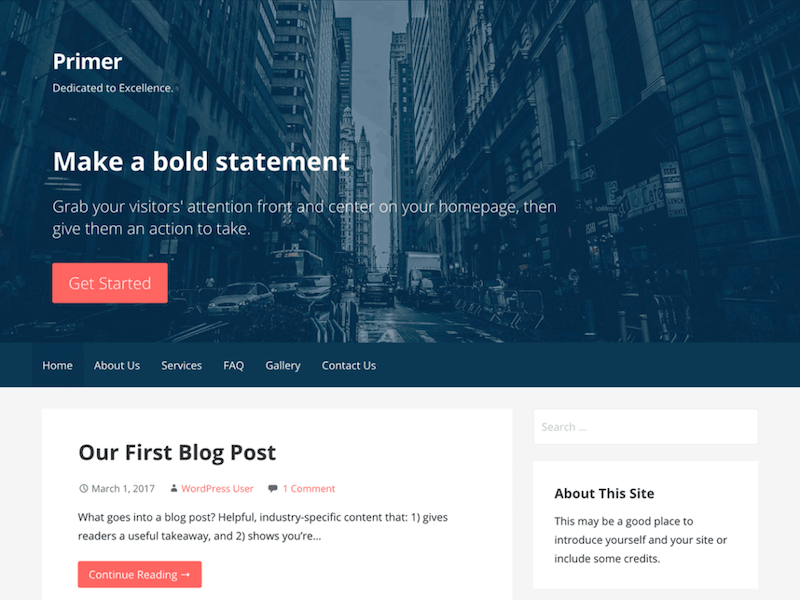 The Underscores Framework is an excellent WordPress start theme. 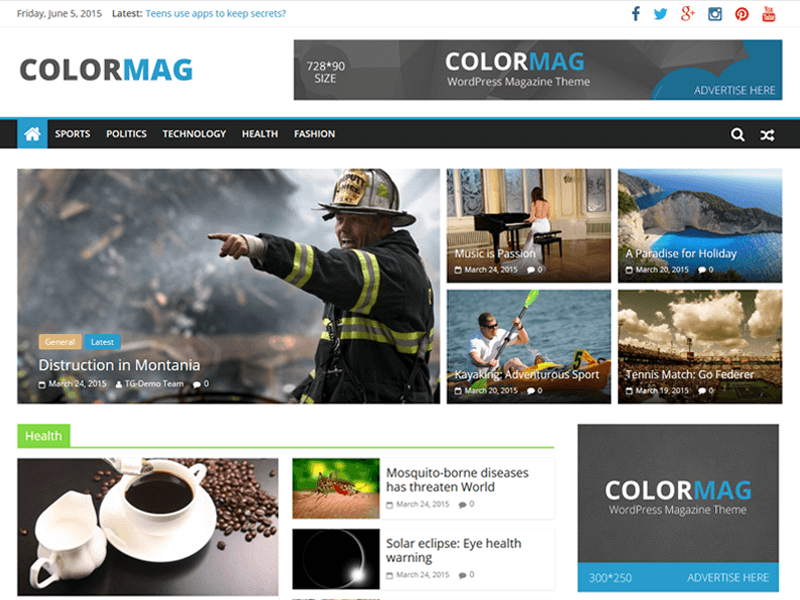 And was most recently mentioned in our roundup of the best WordPress starter themes. The keyword “prime” in products tends to be used when the product is meant to cover everything for its category. Based on this concept, Magazine Prime from ThemeInWP covers all aspects of magazine blogging. You can’t overlook the modern touch of Magazine Prime. And the professional build of the theme is made ready for some prime time traffic! 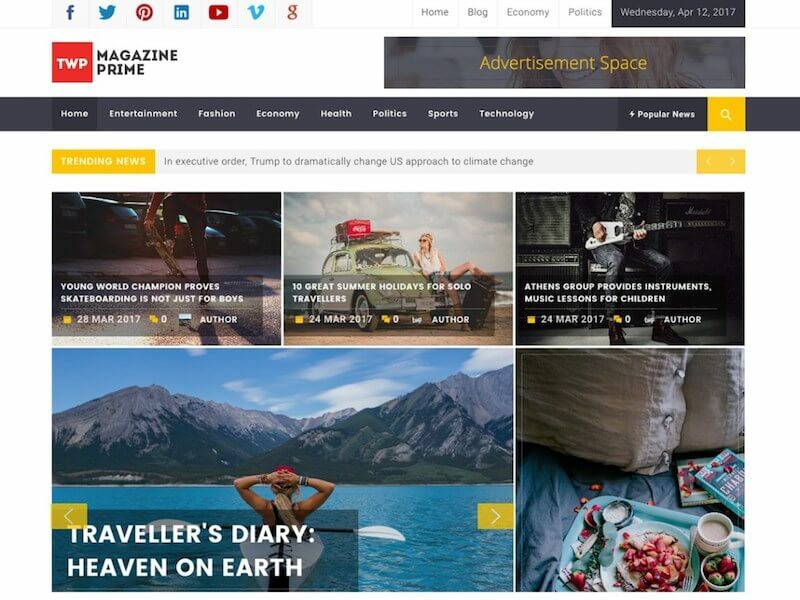 You can find Magazine Prime being used by food brands, beauty publishers, and publishers with tons of new content on daily basis. Technology blogs are another suitable fit for MPrime. Magazine Prime has a custom tutorials post type, which is ideal for explaining concepts through a step by step framework. You have multiple options to select from wide range of theme options and numerous layouts that fit your necessity. Serenti is so eloquent I might consider using it for my own blog, haha! Seriously though, this elegant blog theme has great potential to accumulate a serious following. As it stands, Serenti caters to travel, fashion, personal and lifestyle bloggers. Design wise, you get lots of room for optimization. And for someone who loves to personalize things, customization is everything. The other thing is clutter, for a personal blog (or even travel) there isn’t any room for distractions. Leave banners and toxic advertising material to big publishers. A personal blogger who builds a brand out of his blog is typically generating revenue through books and courses anyway. An Instagram feed widget at the bottom of the site nicely ties together any missing colors. Of course, if you feel like any colors are missing. Don’t starve your needs for a particular feature, and use Theme Options to go wild with adding more elements to your Serenti-built website. Anastis Sourgoutsidis has worked on two free themes so far, and Olsen Light is his most popular one yet. 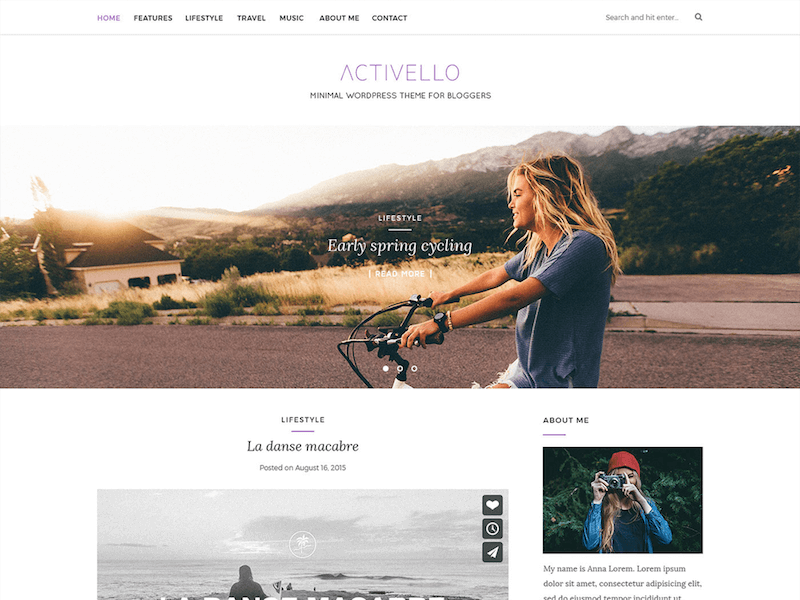 This fabulous lifestyle theme is a fit for lifestyle bloggers as it is for fashion writers. The extraordinary design meets you in the middle as you express yourself through writing and images. Yes, Olsen Light favors visual content heavily. As can be seen in the preview blog posts, including a Gallery into a post translates in a pleasant user experience. A must-have for fashion bloggers, but also travel and lifestyle writers. What would travel blog posts be like without images? You’re right, absolutely worthless. Anastis tries to push out as many updates as he can. Popular themes tend to have a lot of buzz around them, and it’s hard work to keep everyone happy at the same time. One way that Anastis tries to tackle this problem is by integrating Olsen with Customizer. So, if a font doesn’t match your imagination, or a particular color is making your eyes bleed, you can hop into Customizer and magically make them reflect your vision. ZBlack Lite has been generating momentum for the last few months and is nearing the 1,000+ users mark quickly. 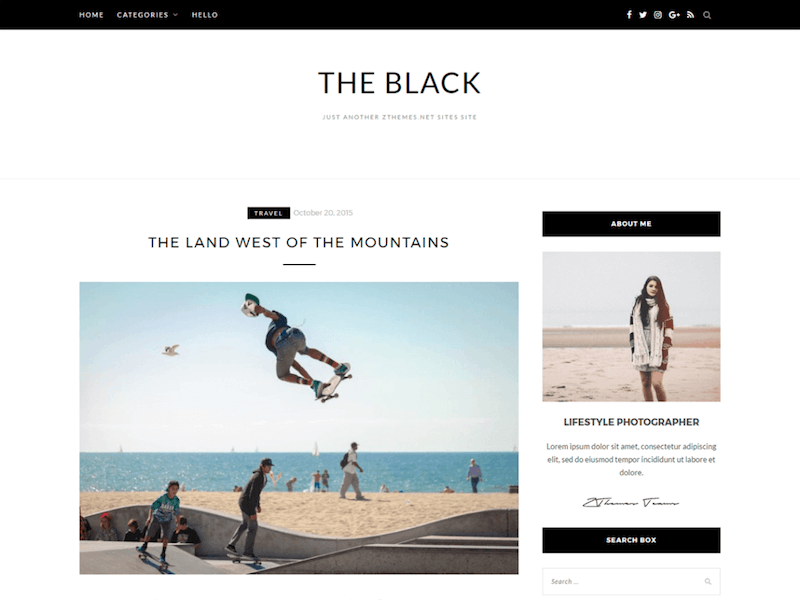 The ZBlack looks like a strictly personal blog theme. Which is everything we could ask for in a roundup of the best free WordPress themes, is it not? Key details of ZBlack are Customizer Integration, Color Schemes, Logo Management, Custom Settings for Posts and Pages, Social Networking (Feeds and Icons), Translation Support, and SEO Optimization! That’s a lot for something that you don’t have to pay for. But we’re not budging. If anything, I’m fond of ZBlack as a clean and content-first theme. Instagram users can go ahead and add their Instagram feeds to the site using a widget. The said widget shows up right before the footer part of your homepage but also pages and posts. In the three years that Nirvana theme has been available for download, it’s sustained well over 30,000 active users. Big respect to CryoutCreations for sticking with their project and supporting the community along the way. What is the Nirvana theme? The word “Nirvana” is frequently associated with Buddhism, which regards “Nirvana” as the final stage of human evolution: enlightenment. Is this theme enlightening? Surely not, but does have that magical feel to it. And we’d guess that most of that magic is generated by Nirvana’s configuration framework. Although we haven’t checked for sure, the author claims more than 200+ customization settings. And if that’s not enough, the user interface yields an intuitive browsing experience. You know, just in case you get lost. Ernest Hemingway was a super influential writer in American history. Any big time writer will tell you that Hemingway has had at least a little bit of influence on their lives. And now Anders Norn has taken it upon himself to publish a theme by the name of Hemingway. 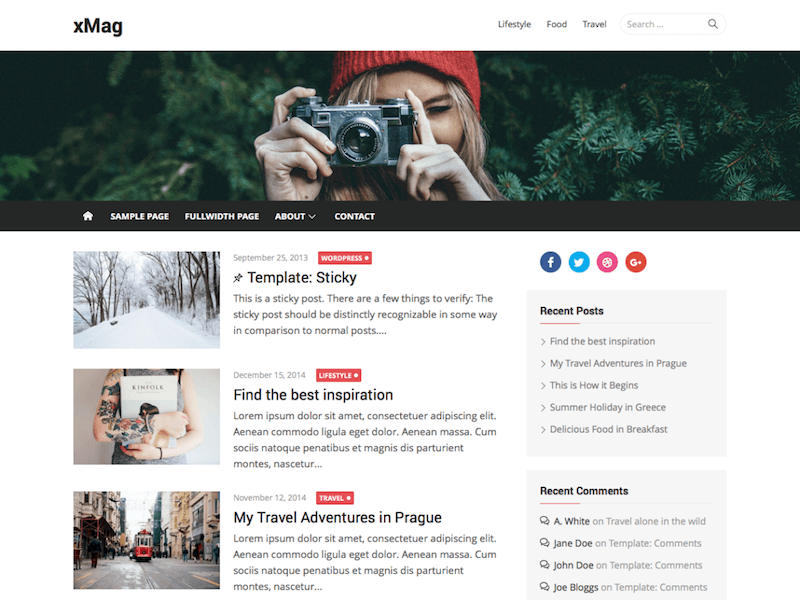 A blogging theme for writers who enjoy their craft. How to best describe Hemingway theme? 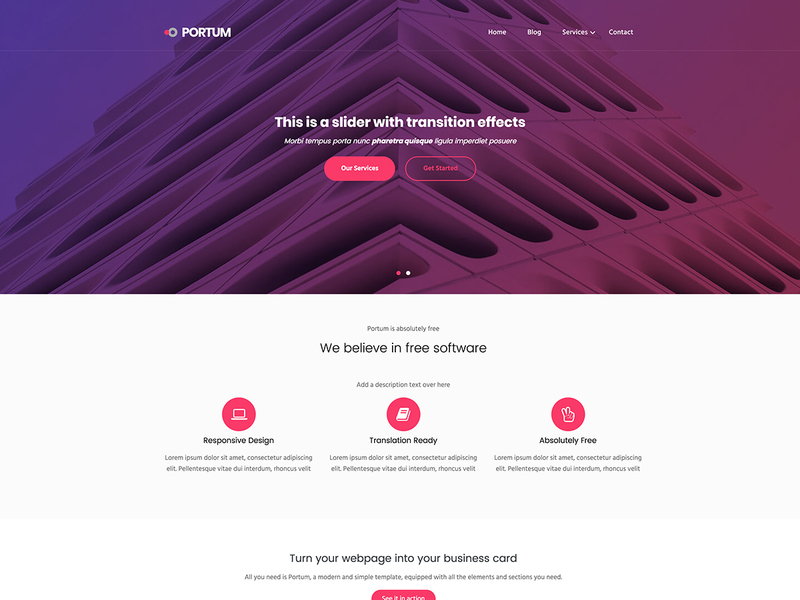 With sharp colors, bold typography and large images, the theme looks perfect in its natural setting. Furthermore, you can save precious time by not having to configure anything. Would you like to add a content slider? Easy, just click activate. Same goes for additional content areas and widgets. 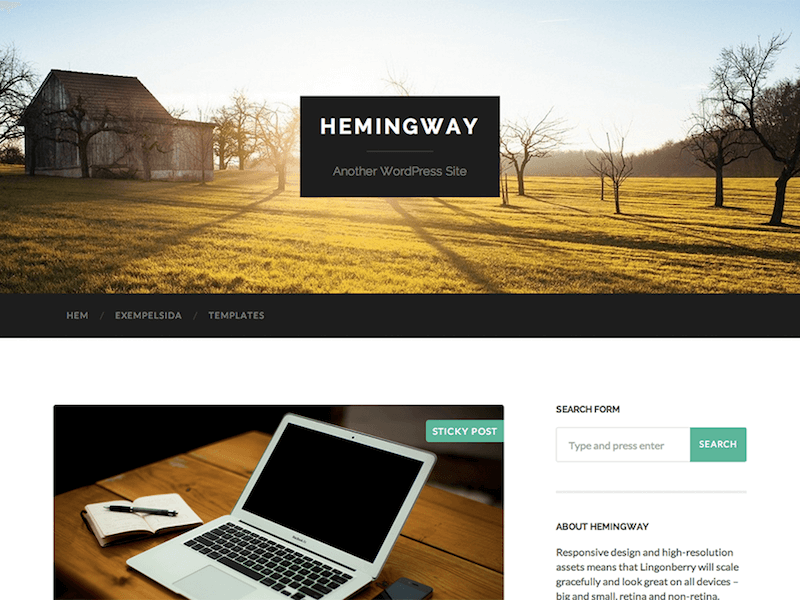 Hemingway theme tries to incorporate as many intuitive elements as WordPress allows. And you can extend traditional post formats with video, images, and quotes. Dyad used to be a theme for the WordPress.com platform but was recently retired. However, Dyad remains alive and well on the self-hosted WordPress platform. 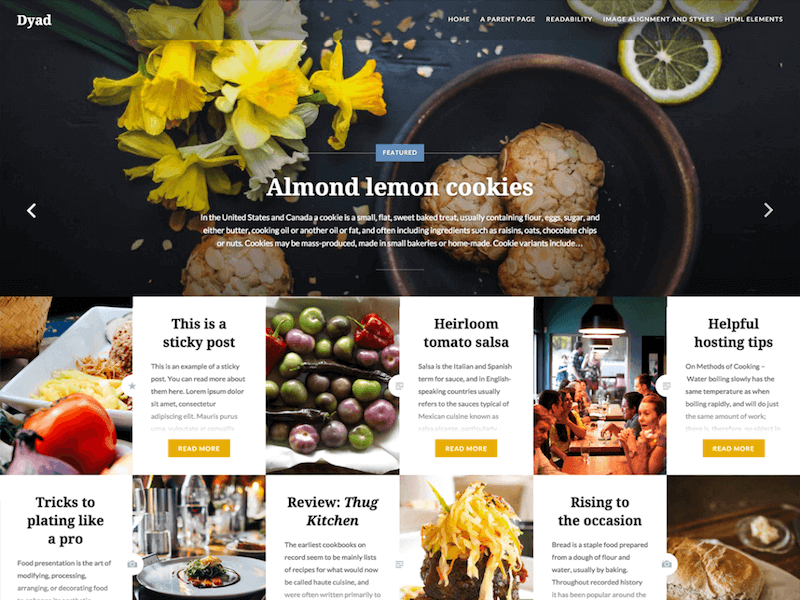 So, you can still enjoy the benefits of using an Automattic-built food blogging template. Although the last update goes back to 2016, the developers well-prepared Dyad before Automattic decided to abandon the project. The Dyad incorporates a smooth balance of style, elegance, and semantic alignment for content. The end result is a stellar presentation of photography and content display. We’ve yet to see a theme for which ThemeIsle hasn’t given it all. 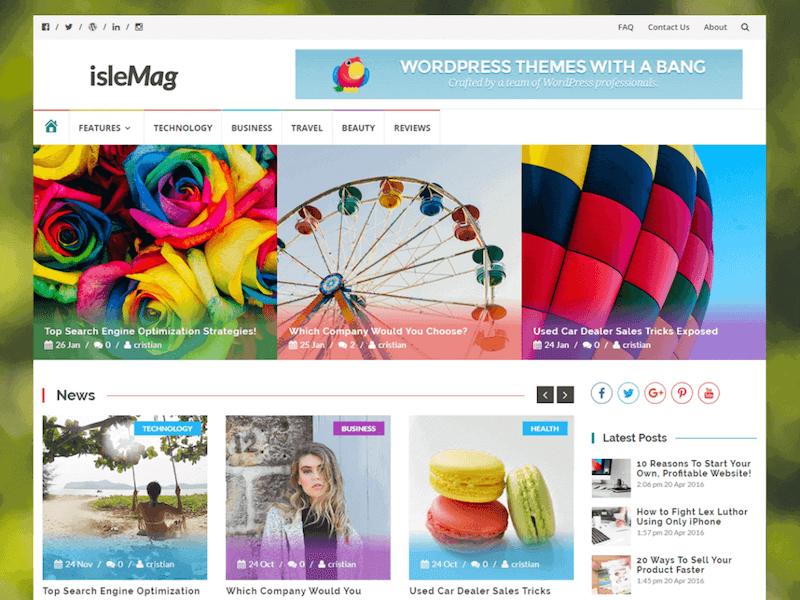 IsleMag, a colorful magazine theme, will rock your blogging world to endless limits. This boxed design (with an image background) template is ready to take on the challenge of the busiest magazine sites in the world. A codebase with performance in mind performance in the Grade A+ levels, and satisfies those with a technical apprentice. You can showcase your content in layers, with big sections divided as separate content widgets. So, if you write about ten different topics on a single site, each topic gets the attention it deserves. Once you setup one content widget, adding others becomes intuitive. Bloggers who generate revenue through sites like Google AdSense, rejoice! IsleMag supports banner widgets and has custom placement across the theme so you can maximize the earning’s potential of your writing. I’m stunned by how many terrific themes are available for bloggers and writers. Seriously, we should call ourselves lucky. And these days nobody likes to write about free stuff because it doesn’t look as nice as premium themes. Well, I think we can all agree that this roundup proves otherwise. Free themes can easily beat a premium design, and sometimes by a large margin. 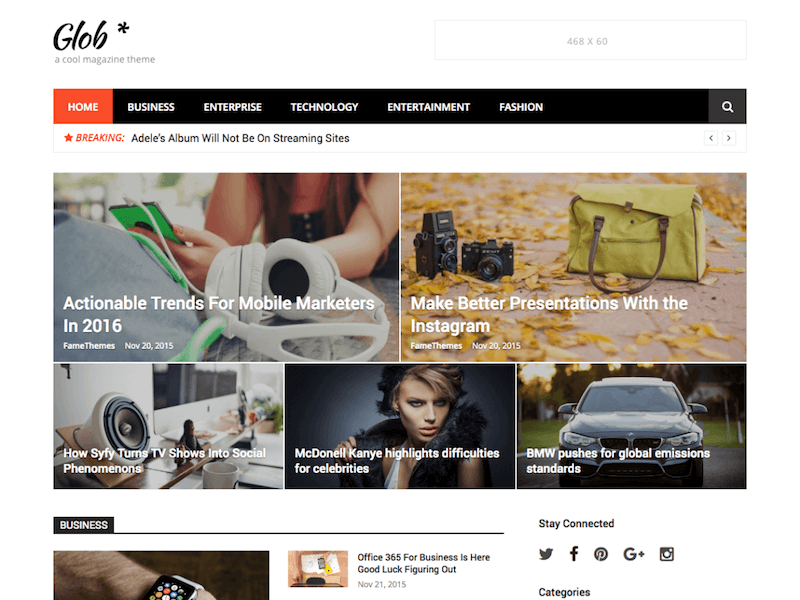 Glob, a magazine theme from FameThemes, is equally capable of matching the offerings of a premium blog theme. In fact, with SEO optimization, cross-browser functionality, and a built-in customizer — Glob does everything a premium design would. Are you ready to change your perspective on free themes? 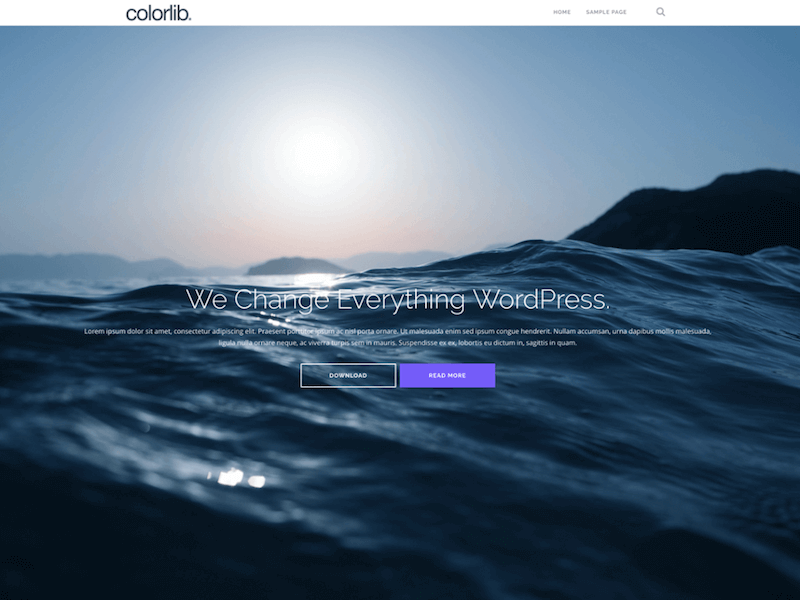 Thank you Colorlib for such an amazing list of Free themes. We have used your Sparkling Theme and it was awesome. The only issue was with the Sparkling was the featured post. So we have switched to another theme. Could you please explain in more details what problem did you have, so we can fix it on the upcoming releases? The Featured Title and the excerpt were overlapping the slider button. Thanks for this Post Admin, I love Nirvana Theme. Its really special. 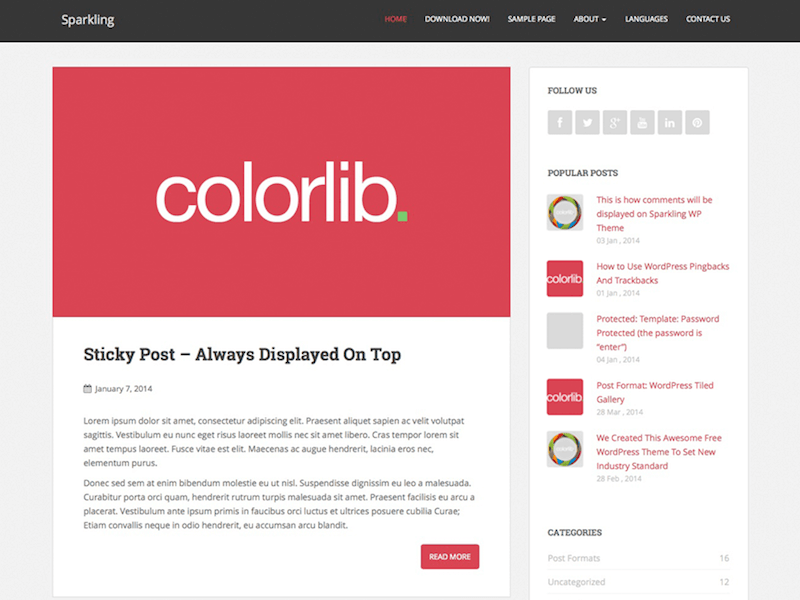 Very Nice collection of free WordPress blog themes. I love all the themes thank you! Hopeful to see your new themes soon.